There&apos;s crisp chill to the air, the crunch of leaves underfoot and the sound of school buses trolling for children in the early morning hours, it must be Fall! 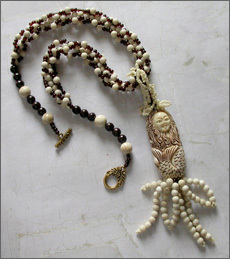 The even count peyote tubes and the pearl accents are all stitched with one thread... Begin at one end & when you reach the desired length - you&apos;re done! 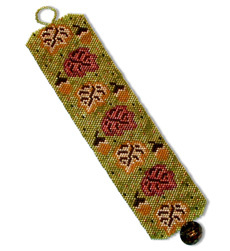 Stitch a stunning peyote cuff in glowing translucent colors to reflect the change of season. 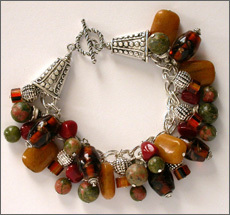 A full 1 & 3/4" wide this bracelet makes a bold fashion statement. The cuff fits snug to the wrist at 7" long. 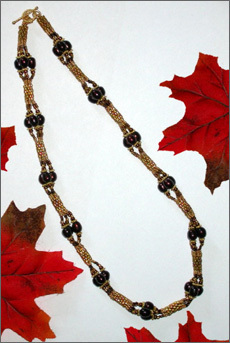 Spice up your fall wardrobe with this spectacular beaded necklace. 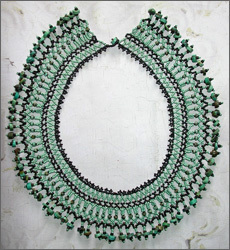 18" long and 2" wide, looks great inside an open collar or over a turtleneck sweater. Start with a pattern you like and then kick it up a notch, add your own twist to the ingredients. Pattern is not included. Orange, yellow, & green maple leaves are scattered in a random pattern across a rich brown ground. Another pattern with leaves in rows is provided for those who like things nice & neat. 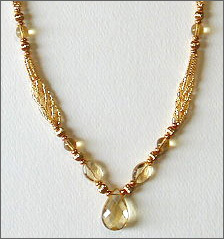 Inexpensive wrapped-wire spacers from the craft shop look fabulous with the marcasite size 8 metal seed beads. A pair of earrings completes the look. This incredibly supple bracelet has a surprise triangle base. Triangles line up wide and narrow making the accent loops a snap to add and the drape & feel unbelievably smooth. Q. When is a spiral not a spiral? A. When it is stitched with larger beads it looks like a braid! 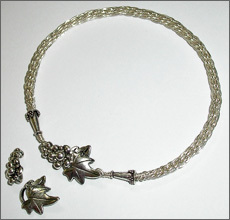 You will like how easy this bracelet is to construct and how smooth and symmetrical the wire braid is with a little practice. Set includes 4 diamond-coated tips that screw into a lightweight, but sturdy, aluminum handle. I found it invaluable when working with freshwater pearls. The holes were just a tiny bit too small for the wire I wanted to use and the bead reamer saved the day and the design. 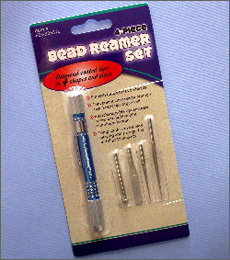 Also great for smoothing rough holes in stone and metal beads to save wear and tear on your stringing materials. Morex Corporation announces a new line of beautiful ribbons with sturdy twisted wire needles already attached. Choose from sheer, satin and taffeta styles in a wide range of colors including silver and gold. 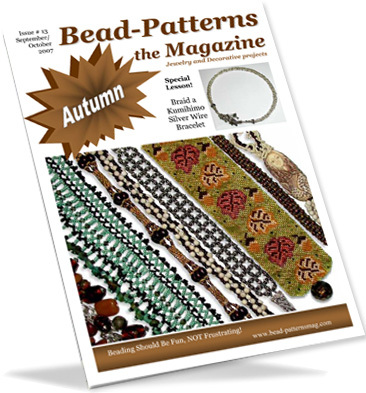 Ask for Ribbon to Bead at Michaels Craft Stores, or from your local bead shop. 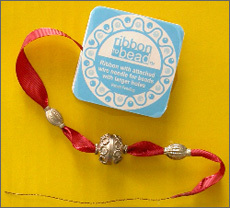 Visit RibbonToBead.com for creative project ideas.